As I showed in my Seven, last week I rearranged & reorganized my most well-used place in the apartment. Though I am one to grab my computer & papers and set myself up on the couch, bed, kitchen counter, & even the floor, I love being able to work at a nice, clean desk. Our only size requirement in leasing our apartment was enough space for us both to have our own desk. Living in Brooklyn, this can be a tall order. Thought it's a bit cramped we each managed to create our individual office spaces. Mine just has a bit more colour & beauty products. Today, I thought I would share my space. Both Preston and I purchased the ever-so-popular Ikea Micke desk in Black/Brown & White. It's absolutely perfect (in my opinion). It's very long which allows it to function as both a desk and a vanity. There are also two pull-out drawers. The left side is my office side while the right stores my beauty essentials. On my right, I have some of my beauty essentials. In the Leaves B&BW candle holder, I have nail care items such as base coats, top coats, cuticle cream, & cotton balls. I bought this skull mug for Halloween but have loved using it year-round to hold my make-up brushes. I keep my favourite & recently purchased nail polish in this simple blue tray. Office supplies organized in wire bins. Make-Up organized by function in white plastic bins. 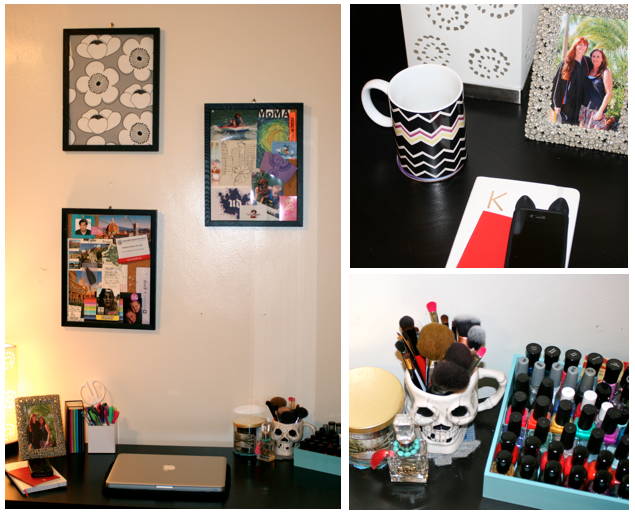 I love having a mix between functional pieces and personal decorative items on my desk. Having both the sentimental and the efficient, increases my productivity while maintaining a level of happiness. I spend a lot of time at my desk (albeit I should be spending even more! ), so it needs to be a space that can serve multiple purposes, be functional, and look inviting. 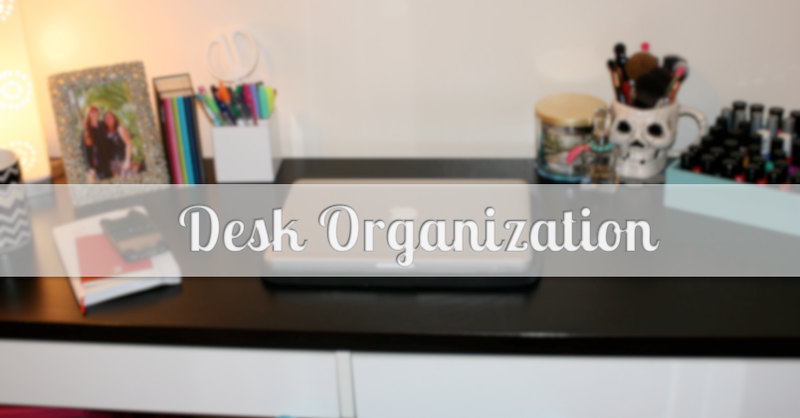 What are some of your desk essentials & storage solutions?